As the newness of spring begins to wane and the summer sun smiles down from its place high in the sky, we find ourselves with a greenhouse full of the lovely Brazilian Cattleya warneri. This delightful species provides a display of lavender and purple that rivals and is reminiscent of its autumn-flowering sister from Brazil,Cattleya labiata. Were it not for their wide difference in blooming season, the flowers of one could easily be mistaken for the other. The two major large-flowered BrazilianCattleya species, C. labiata and C. warneriare no strangers to each other in botanical and horticultural lore. Few orchids have been haunted so much by a closely related species as C. warneri has by C. labiata. Cattleya warneri’s similarity toC. labiata has clouded its past and often unsettled its future, and the problems started even before C. warneri was officially discovered. The first European to find C. warneri was the naturalist Dr. George Gardner, who found it in the Brazilian province of Minas Gerais during a trip in the late 1830s. Unfortunately for C. warneri, Gardner was convinced he had rediscovered the lost C. labiata, soC. warneri started its trip into the wonderland of orchid nomenclature as “Cattleya labiata” and there it stayed for the next 25 years. In August 1862, all this changed when Robert Warner, a prominent orchidist of the time, published his magnificent Selected Orchidaceous Plants, in which he pictured four gorgeous lavender flowers under the name “Cattleya warneri,” and included a botanical description of the new species by MS Moore. Warner pointed out in the text that C. warneri had to be a new species and not a C. labiata, because it flowered at a completely different time of the year than C. labiata. The 1880s, however, were not so kind to C. warneri. During this period, the eminent horticulturalist James O’Brien championed the idea that all the large-flowered Cattleyas should be species in their own right and not subspecies or varieties of C. labiata. O’Brien argued that these species were distinct and individual horticulturally and not at all like C. labiata. The only plant he left under C. labiatain the old mold was C. warneri, which remained C. labiata var.warneri for no apparent reason other than, like C. labiata, it came from Brazil. With time, however, C. warneri slowly rose to the same rank as the other large-flowered Cattleyas, and today it is accepted as a distinct species. Cattleya warneri has several characteristics that make it different from C. labiata. Cattleya warneri has shorter and stouter pseudobulbs than C. labiata and produces a more compact plant. The leaves of C. warneri are broader than those of C. labiata, and although they both have characteristic double sheaths, recent work by Érico de Freitas Machado in Brazil suggests that the double sheaths may not really be the same. The most obvious difference between the species, of course, is the one Robert Warner alluded to in his original description in 1862 — their different flowering season. Cattleya warneri flowers in the spring (late May and June in the United States), while C. labiata is an autumn bloomer (September through November). The two species also make new growths at different times of the year: C. warneri in the autumn and winter, and C. labiata in the spring and summer. They also root at different times in their growth cycle – one before flowering, the other after flowering. (Rogerson; Orchid Digest 68-4, pg 203) These differences in growth, rooting and flowering periods exist even when C. labiata and C. warneri are grown side by side on the same bench in the same greenhouse, so they are inherent in the plants and are not caused by environmental or regional factors, as some have suggested. Cattleya warneriis certainly one of the nicest of the late spring-floweringCattleya species to grow. Its lavender color is unusually clear, and its large size and ease of culture make it a good plant for both the beginning hobbyist and the expert. It also has a great many color forms that make it attractive to collectors. Cattleya warneriis not known for its well-shaped flowers, a characteristic it shares with C. labiata. There have been clones found, however, with superior form and several were awarded by the Royal Horticultural Society in London in the late 1800s. Most alba C. warneri are more poorly shaped and smaller than the lavender flowers, although one alba clone exhibited by Peeters in 1903 received an FCC/RHS and was described as having “very fine large flowers.” Certainly the C. warneri alba used by Sander in 1915 to make the original cross of Cattleya Lady Veitch (warneri alba xlueddemanniana alba) must have been outstanding, because this cross produced magnificent round white flowers, of which two received FCCs from the Royal Horticultural Society. Cattleya Lady Veitch ‘Superbissima’was a huge white with overlapping petals. Remakes of C. Lady Veitch, however, have all produced mediocre flowers because of the poorly shaped C. warneri used to make them. A commonly available C. warneri alba sold in the United States today is “McPeak’s Variety,” which is floriferous and easy to grow, but has narrow petals and sepals that can bend backward when fully open, which is not a desirable characteristic. Semi-alba varieties of C. warneri are very rare, and the most well known one is the clone ‘Itabirana’ which is pictured in L.C. 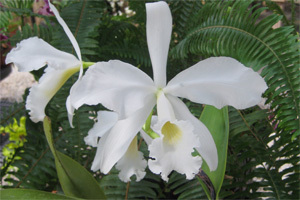 Menezes fine book entitled Cattleya Warneri, published by Naturalia in 1994. Menezes also includes in her book pictures of a wide variety of lavender varieties of C. warneri, which makes the book an excellent reference for color forms of this species. Cattleya warneri has always had a number of dark clones like ‘Ardenholm’ and the species is noted for its dark varieties. Although some C. warneri have petals that fall forward, most stand upright, giving the flower an attractive form even though the petals are not wide. Flowers of C. warneri range in size from 6 to 8 inches across, and one plant is recorded that had four flowers, each measuring 93/4 inches across. Cattleya warneri’s broad leaves are passed on to most of its hybrids, and if you look back into the parentage of a Cattleya hybrid that has broad leaves, you will invariably find C. warneri as a parent. The double sheath of C. warneri also some-times appears in its hybrids. Although C. warneri seems to have been continuously available following its introduction in the1860s, it was never in plentiful supply. Linden did not include a picture of C. warneri in his famous book Lindenia because he did not have many plants to sell, and C. warneri was never a significant factor in the cut-flower market of the 1930s, 40s and 50s in the United States. 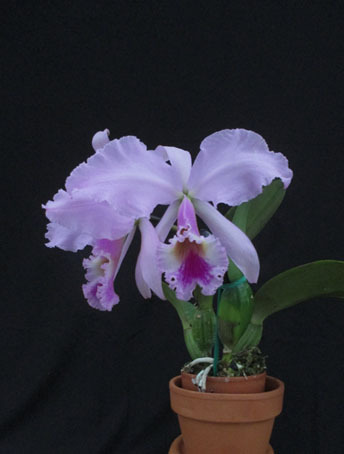 Cattleya warneri’s historical place has been as an exhibition and hybridizing plant, where its size and floriferousness produced a striking display, and its flowering season opened new doors to spring hybrids. Because of its ability to produce late-spring-flowering hybrids, particularly June-flowering hybrids, C. warneri’s place among the large-flowered Cattleya species will always be secure. Here the haunting specter of C. labiata fades into the shadows, because you cannot produce spring-flowering hybrids with C. labiata. The list of primary hybrids of C. warneri reads like a who’s who of the late-spring cut-flower plants of the 1930s and 40s. Cattleya Myra Peters alba (warneri alba x gaskelliana alba) was one of the earliest fine white Cattleya hybrids to flower in the wedding month of June.Cattleya Dupreana (warneri x warscewiczii) was a standard of excellence in June lavenders and was the parent of most good June-flowering dark-purple hybrids. Cattleya Comet (warneri x dowiana) can be an extremely dark June flower. Cattleya warneri crossed withCattleya R. Cadwalader is even called Cattleya June Time. When C. warneri was first exhibited at a meeting of the Royal Horticultural Society in 1860, it was awarded a Silver Medal with the remarkable citation that the award was given “as a mark of the esteem and admiration with which its appearance was hailed.” No other Cattleya species has ever received such a compliment. Happily, after 145 years, C. warneri is still with us to add to the brightness and color of our long June days. Like a beautiful maiden from a long-forgotten tale, C. warneri gently closes the gates of springtime and, with a radiant, bubbling smile, laughingly throws open the doors to summer, unaware that her haunting sister of the autumn wind, C. labiata, ever existed. Although C. warneri is not a difficult species to grow, it does have its own unique requirements. It is actively growing, for example, during the winter months in the United States when most otherCattleyas are dormant. Because of this, it is sometimes difficult to give it the best growing conditions. Like most other Cattleyas, C. warneri needs a warm, moist atmosphere when growing and this can be difficult to provide in the winter in a greenhouse when the sun is at a low angle and the outside temperature is well below freezing. This is compounded by the problem that most of the otherCattleya species like cooler, drier conditions in keeping with their dormancy in the winter. Since C. warneri will tolerate less than the best conditions and still produce a satisfactory growth, it can usually be grown with the other Cattleya species if you put it in the warmest and sunniest part of the greenhouse in the winter. This means you may sometimes have to hang it near the glass to give it the heat and sun it needs to grow well. Most growers recommend that Cattleya warneri be grown with less sunlight than most other large-flowered Cattleya species and we have also found this to be true. Your best guide for this, of course, is still the color of the leaves which should be light green. A well-flowered C. warneri will produce four flowers on a spike, and five flowers is not unusual. If you have your C. warneri plants hanging near the glass during the winter, you should put them back on the bench as soon as buds appear in the sheath. High temperatures are not desirable after the buds form, and intense sunlight can actually cook the buds in the sheath and kill them. A strong growth will normally produce a double sheath. A weak or late growth will sometimes produce only a single sheath or no sheath at all. Like all the Cattleya species, you should water C. warnerithoroughly and then let it dry out completely before watering it again. A continuously wet medium will rot the roots. Repot C. warneri only when it begins sending out a flush of new roots and preferably during the warm summer months.